If your business uses flyers to promote itself, then you’re probably pretty accustomed to the usual formula. Whether you’re distributing them on the street or you have them sat in the reception of your office, generally most flyers all look the same. They’re normally small bits of card, printed with your logo, design, slogan or whatever you like on the front. The main issue with flyers, other than their small size and distributing them, is that it’s often difficult to make them stand out. Many flyers have a very similar design, which can be off-putting to people who may pick them up. After all, it’s just another piece of clutter taking up space in their lives. So what if you could make your flyer look and feel different, create something that will stand out from a backdrop of tedious and dull equivalents. At Kaizen, we’re committed to providing businesses like yours with the best opportunities to promote themselves and we believe our folded flyers are a fantastic way to attract attention to your business. We all know how useful flyers are as a promotional item. While they may lack the size and mass appeal of posters, if you’re committed enough, you distribute them to a large number of the population who will have no choice but look at what you’ve just thrust into their hand. So what are folded flyers? Well, basically, we take either an A5, A4 or A3 paper size and folded it into thirds. We’re then able to print on every panel, meaning you can have more information on a flyer without compromising on your design. Folded flyers are fantastic for a variety of uses. Perhaps you’ve opened a new gym and want to showcase your pricing and classes on offer or a hairdresser looking to show the services you can provide to customers, our folded flyers are a fantastic choice for any situation. 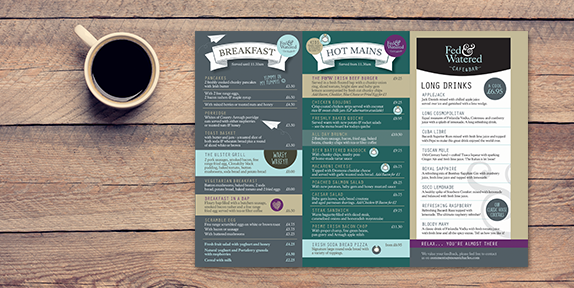 One of the most popular uses for this type of flyer is for a takeaway menu, with many of Belfast’s most well known takeaways choosing us to produce their menus. We’re able to print on high quality 350gsm silk paper, with uncoated and lower weights also available if you prefer a cheaper option. Large print runs are available too, the maximum we can print is a run of 20000, so there’s almost no limit to the amount of flyers your business can have. As a flyer printer in Belfast we are able to print on A5, A4 or A3 paper sizes, with our most popular option being our triple folded A4 option, often considered the standard issue size for this kind of flyer. Our flyers are 100% customisable with your design, logo, slogan or whatever else you desire and if you aren’t as design minded as you’d like, Kaizen’s expert design team are on hand to help you in all things design.